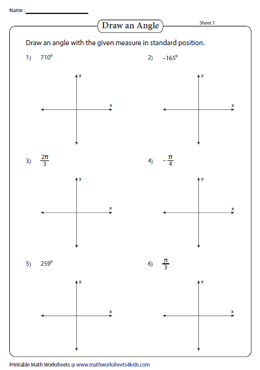 Quadrants and angles worksheets provide enormous practice for high-school students in learning how to identify the quadrant containing the terminal side of the angle, to draw the indicated angle on the coordinate plane, to measure the angles in the quadrant and more. 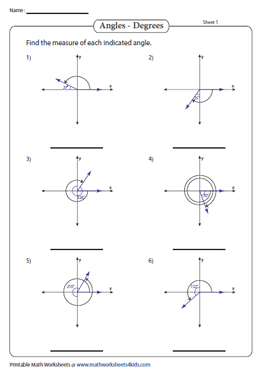 The worksheets are offered in both degrees and radians. 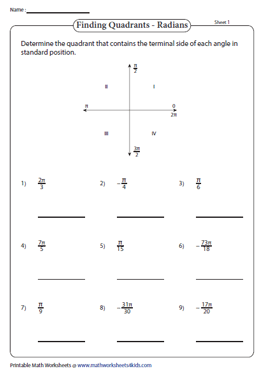 This set of worksheets requires students to determine the quadrant containing the terminal side of each angle. The angles are provided in degrees. A coordinate plane is split into four quadrants. Find the quadrant that contains the terminal side of the given angle. The angles are provided in radians. Use the coordinate axes provided in each problem to draw an angle for the given measure. Draw clockwise for the negative angle & counter-clockwise for the positive angle. 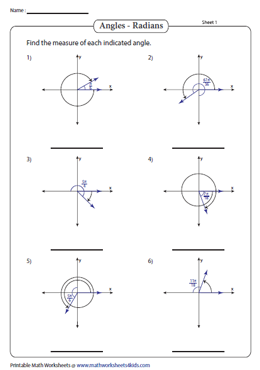 Each worksheet offers six problems determining the measure of the indicated angle in degrees using the given angle. Verify your solution with the answer key. Identify the measure of the indicated angle and write the value in radians format. Multiple worksheets offered for a thorough practice. 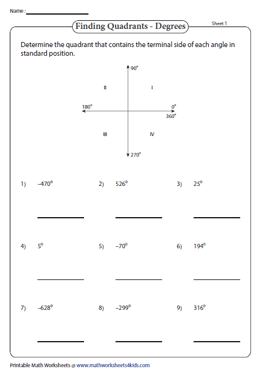 Each worksheet comprises six multiple choice questions covering different aspects of quadrants and the angles.